At the front of the room were eight orange pill bottles. They represented the eight lives that would be lost over the span of an hour to the opioid epidemic. Renowned photographer Nan Goldin used to take photographs of drugs strewn about her bedroom rug when she lived through an addiction that began when her doctor prescribed her the drug for pain management. Now the mock bottles are used as props in protests against the Sackler family, owners of Purdue Pharma, which created OxyContin, the highly addictive pain medication that Massachusetts Attorney General Maura Healey says was systemically and ruthlessly marketed to doctors and patients, despite its clear links to overdose deaths. 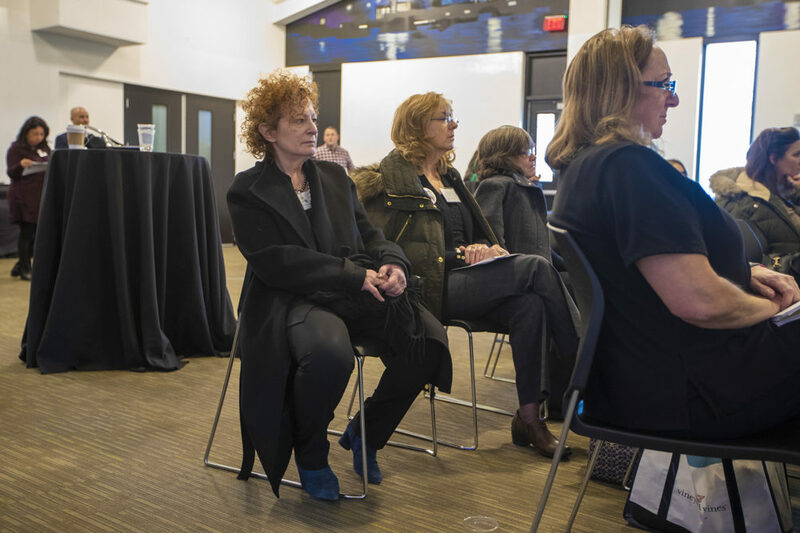 On Thursday, Goldin brought the pill bottles as props to the Seaport's District Hall, where she took part in the Opioid Epidemic Accountability Conference to discuss policy, activism, and how to best hold those responsible accountable. “I think they [the implicated Sackler family members] need to be in prison,” Goldin said. “These are some of the biggest dealers in America." From 1999 to 2017, almost 218,000 people died in the United States from overdoses related to prescription opioids, according to the Centers for Disease Control. Overdose deaths involving prescription opioids were five times higher in 2017 than in 1999. Thursday's conference — coincidentally, organizers say — took place on the heels of Healey's release of court documents that accuse eight Sackler family members and nine Purdue board members or executives of aggressively pushing opioids on prescribing doctors despite knowing the drug was causing overdoses. Purdue has said Healey cherry-picked the company's emails to present a false narrative that distorts the impact of its medicine, which represent less than 2 percent of opioid pain prescriptions. Goldin believes the implicated Sacklers operated under the protection of the family name's philanthropic reputation. The Sacklers, one of the wealthiest families in the world, have donated to dozens of institutions, including the Louvre, Guggenheim and the American Museum of Natural History, that have etched the family's name on their buildings. Goldin's organization, P.A.I.N. or Prescription Addiction Intervention Now, has brought people together to hurl pill bottles into the Smithsonian and the Harvard Art Museums where a gallery and a museum bear the name Arthur M. Sackler. Sackler died eight years before the invention of OxyContin. Elizabeth Sackler, the president of the Arthur M. Sackler Foundation, has before said she admires Goldin for her activism against the opioid epidemic. She's also said Arthur's descendants never owned shares of Purdue stock or benefited from OxyContin. After Arthur's death, his brothers Mortimer and Raymond purchased his one-third option in Purdue Frederick. The pill bottles clearly say the words: “prescribed to you by the Sackler Family.” The side effect is listed as “death” with the number of dead. 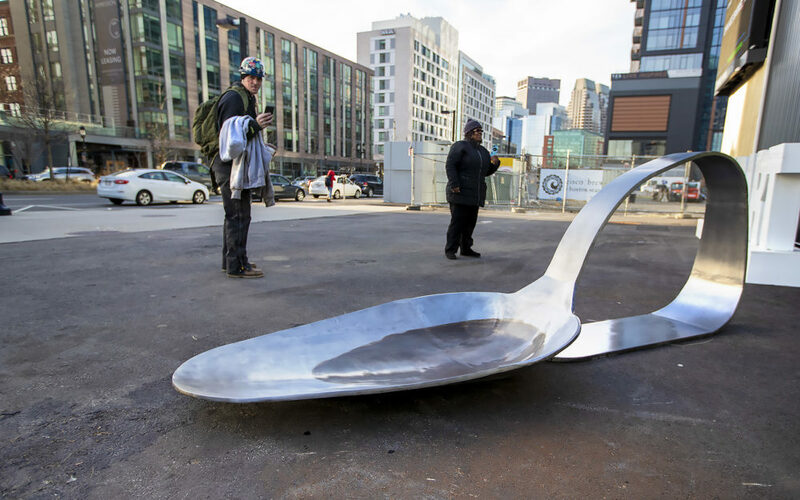 Using art to bring awareness, Esposito built a giant heroin spoon last year and left it outside the headquarters of Purdue Pharma. The sculpture served as a visual cue of addiction's common trajectory: from prescription medication to heroin. 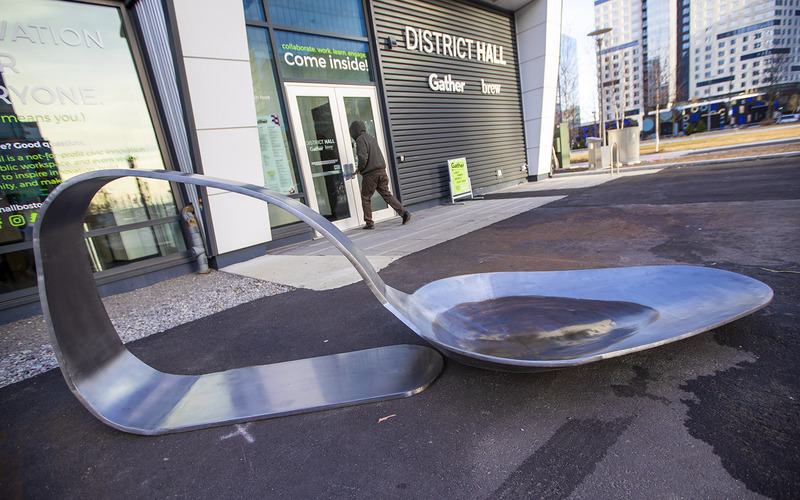 Esposito gifted the artwork to Healey and on Thursday, it stood outside District Hall as people came in and out of the conference. 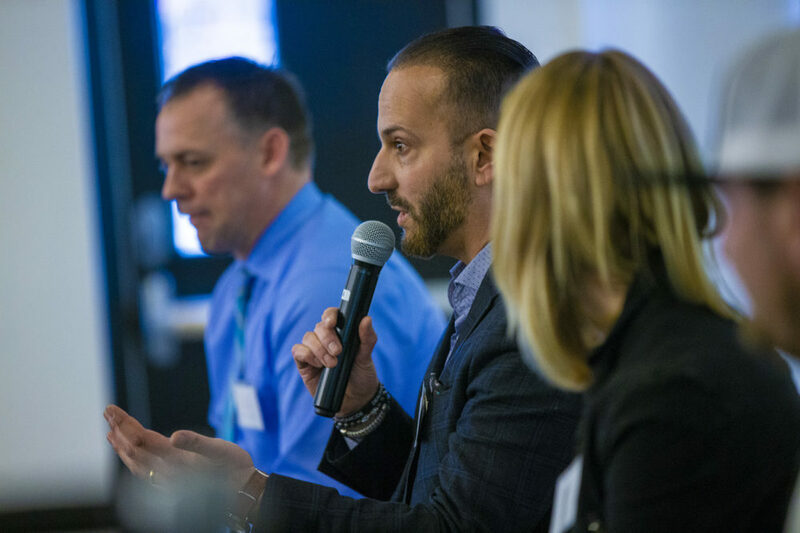 Esposito and his volunteer staff spent months organizing and preparing for Thursday's conference, which had experts from law enforcement, recovery and social services as well as families who lost loved ones to addiction. In a statement, Robert Josephson, a spokesman for the Sackler family members who own Purdue Pharma, said they share the artists' concern for the opioid epidemic. He cited Purdue's funding of state prescription drug monitoring programs, grants for law enforcement and the company's educational initiatives warning teens of the dangers of opioids. Purdue also said it's invested more than $3 million to bring naloxone, an over-the-counter overdose-reversal medication, to the market. The company also said it promoted OxyContin in accordance with FDA approval. The Harvard Art Museum declined to comment for this story. 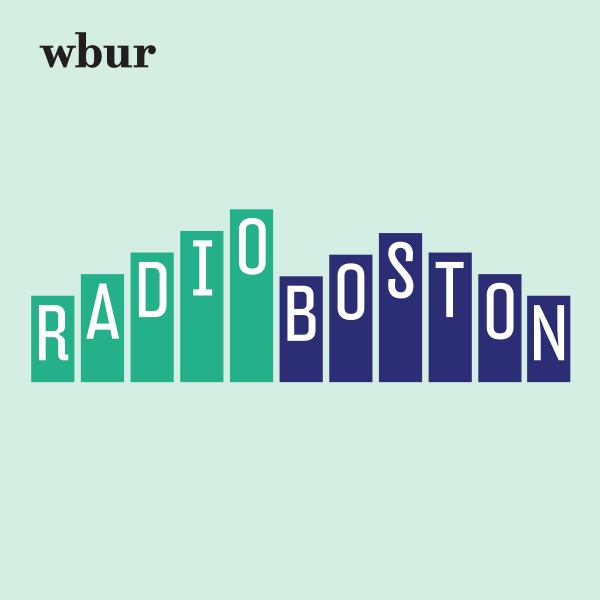 A spokeswoman for the Smithsonian Institution, which holds the Arthur M. Sackler Gallery, sent WBUR a statement explaining that the gallery opened in 1987 following Sackler’s donation of an "exceptional collection of Asian art and a financial contribution." She added the gift came from Sackler and his foundation, and not from a corporation. "The Smithsonian has never removed a name from a museum. We do not expect to do so for the Arthur M. Sackler Gallery, which was named in recognition of Dr. Sackler’s generous gift to the Smithsonian," wrote Linda St.Thomas, the Chief Spokesperson for the Smithsonian Institution. Goldin said it’s a good sign that the Met is reviewing its donor guidelines and plans to keep holding direct actions against Sackler. 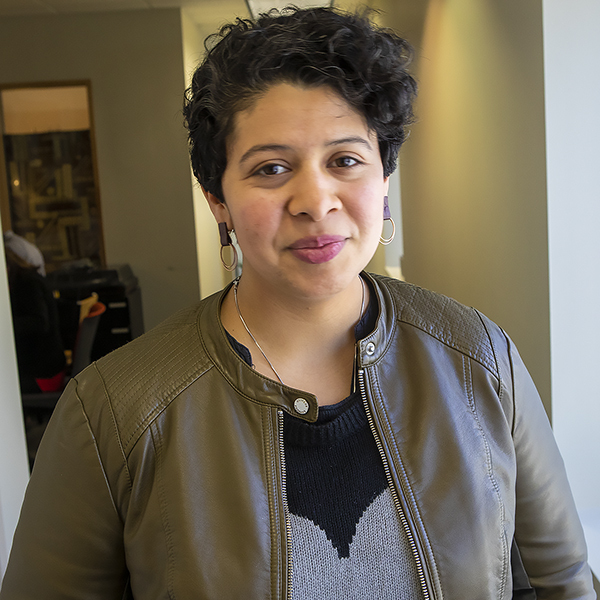 She hopes to one day see the family name stripped from public, academic and cultural institutions.